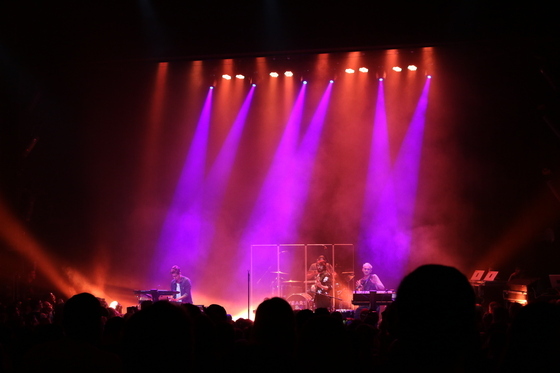 The last time I saw Years and Years, the young British electro-pop trio was headlining legendary London club Heaven, their hit single "King" was about to top the UK charts, and they had never played a show in America. They had the look of a band that couldn't believe their rapid ascent to fame as frontman Olly Alexander breathlessly bounced around like a kid in a candy store. "This is the first time we've had lasers at our show," I remember him saying. 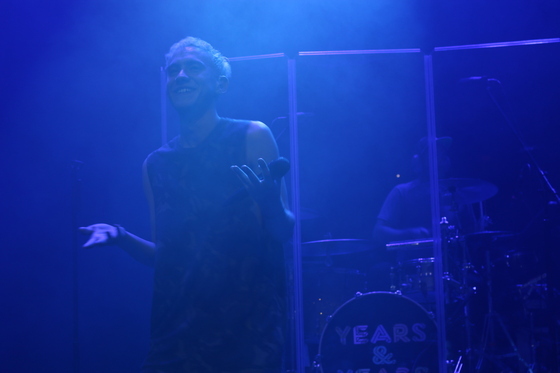 Six months later, the excitement is still there--this is Years and Years' first American tour--but the now-seasoned veterans of the stage have tamed the thrill and shaped it into a confident and enthralling performance. Last night, the atmosphere at the group's Park West show could only be described as brilliant pop ecstasy. Opener Tei Shi delicately prepared the audience for the main event, delivering a sensual selection of REM&B to ease the crowd into the evening. She strutted around the stage, her body undulating in time with the music, her face graced with gold glitter courtesy of a fan in the front row (probably the first and last time I'll ever see an artist allow a fan to apply glitter to their face). Tei Shi made heavy use of a vocal synthesizer to morph her gentle words into a looping choir of nymphs, creating a spellbinding effect as her effective rhythm section--a placid drummer and a focused guitarist/synth player--weaved a lucid dreamscape behind her. The highlight of the set came at the very end, when she unleashed a soaring soprano melody on "Bassically," dropping jaws and earning a slow buildup of applause and cheers. Earlier in the song, there had been a section that sounded like whale-speak, so to hear Tei Shi burst out of that with her impossibly high notes was both unexpected and very impressive. After what seemed like hours following Tei Shi's set, the lights dimmed, the stage glowed red, and the ominous synth runs of "Foundation" pervaded the air as the crowd roared for Years and Years. 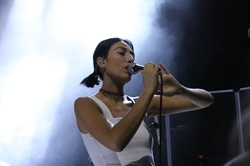 Park West had been full for Tei Shi, but now the place was packed to exploding capacity. If this band's Disclosure-meets-thinner-Justin Timberlake sound is the future of pop music in America, that future has already arrived for a large swath of Chicago's music listening population. They knew every word to every song, clapped to the beat of their own accord, and grooved to everything from the contagious, heart-thumping, Latin-esque "Desire" to the heartbreaking ballad "Memo." The one issue I took with this audience was that many of its members, instead of dancing, were more focused on taking smartphone video of Olly Alexander and company. Unfortunately, that's a widespread epidemic in the concert world and no matter how much energy Years and Years brought to Chicago, a portion of the crowd would have been living for posterity rather than in the moment. Those who were focused only upon recording Years and Years missed out on an electric experience. Alexander, who first entered the public eye as an actor (he's starred in the West End play Peter and Alice with Judi Dench), translated his dramatic instincts masterfully to musical performance. Over the course of his band's fourteen songs, he flowed around the stage like a bubbling stream, a wide smile etched into his face the entire time. He's probably the smiliest frontman I've ever seen. And though his voice started out rather pitchy and weak on "Foundation" and "Take Shelter," the first two songs the group performed, by the end of the set he was belting out the high notes on "Real" effortlessly. Once Alexander got into his zone, he transformed into a nimble but powerful sprite, leading the crowd optimistically through the music even when the songs he sang dealt with the darkness of love ("Desire," "Worship") or overcoming a pained relationship ("Eyes Shut"). 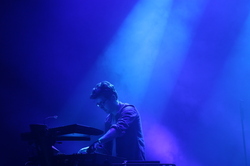 Behind Alexander, his bandmates Emre Turkmen and Mikey Goldsworthy bent over their synthesizers and pumped out rock-solid backing beats that expertly replicated the studio versions of the songs. The focus was never on them, not even when Goldsworthy whipped out his bass guitar and thrummed a funky riff on "Real," and they knew and embraced that fact. Even the live drummer the band had brought along for the show, though he added an aggression and tribal quality to the music, remained cloaked by a plexiglass sound shield that reflected Alexander back onto the audience. Together with a stunning light show that no longer demanded special mention by Alexander, Years and Years took Park West's collective heart in their loving hands and raised it to the level of the famous disco ball hanging from the venue's rotunda. The crowd was alive with a dynamism that Alexander conducted with grace and attention to detail--on "King," the band's encore, he looked out upon the thousand-strong voices singing the song's earworm chorus and grinned sheepishly, having done his job so well that he didn't even need to do it anymore. As I looked out on the throng of rabid fans hanging on every word and moving to every rhythm, I couldn't help but marvel at the way Years and Years had so clearly taken hold in the United States. I can't even imagine what level the fervor will reach if and when songs like "King" and "Shine," the latter of which hit number two on the UK charts, make official American debuts. For now, though, all we can do is appreciate the fact that such a young band has managed to put together such a mind-blowing performance. If Years and Years keeps up with pop production trends, they're going to be in even higher demand when they return to the city.